Biosynthesis of secondary metabolites in actinobacteria is regulated by complex regulatory mechanisms on responding environmental changes. In this study, we have identified a two-component system (TCS) designated as RimA1A2 in the genome of Streptomyces rimosus M4018, with high homology to the TCS RapA1A2 from Streptomyces coelicolor, known for its positive regulatory function towards actinorhodin (ACT) biosynthesis. Using RT-PCR analysis, we demonstrate that rimA1 encodes response regulator (RR) and rimA2 encoding histidine kinase (HK) from S. rimosus that are co-transcribed as a single-polycistronic mRNA. When S. rimosus was cultivated on standard media, no significant difference in culture growth or morphological properties was observed between the rimA1-disrupted mutant and parent strain M4018. 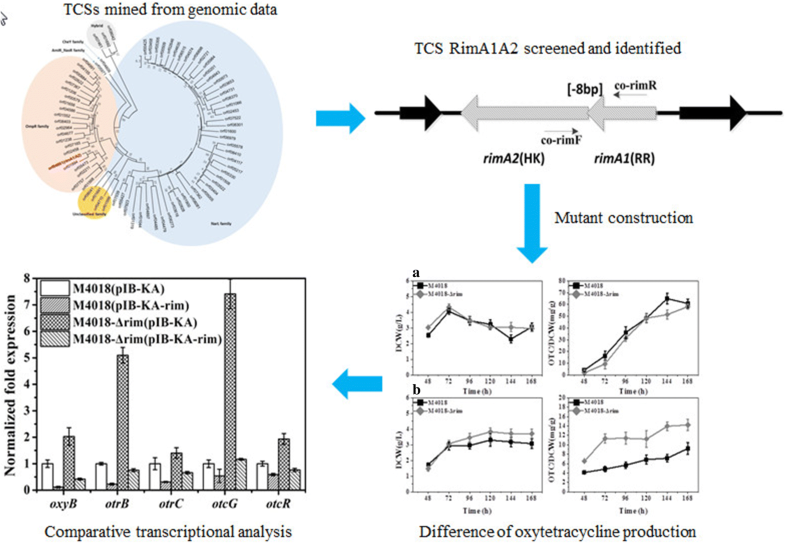 However, the rimA1-disrupted strain displayed significant increase in oxytetracycline (OTC) titer when cultivated in minimal medium (MM) containing glycine as sole nitrogen source, and the transcription of selected genes involved in OTC biosynthesis was increased, supporting the hypothesis that RimA1A2 has a negative regulatory role in OTC biosynthesis via global regulation. We observed an increased resistance of the rimA1-disrupted mutant strain to selected antibiotics. Interestingly, in the rimA1-disrupted strain, OTC biosynthesis was affected under different environmental stress conditions such as osmotic and oxidative stress. Accordingly, this phenotype was observed in a medium-dependent manner. Considering complexity of regulatory networks in antibiotic-producing organisms, this study demonstrates the importance of cultivation conditions, which is often neglected. Streptomyces rimosus is a Gram-positive, aerobic, and filamentous actinobacterium, which produces the medically important broad-spectrum antibiotic oxytetracycline (OTC) (Finlay et al. 1950). S. rimosus is the main commercial OTC producing strain, and the biosynthesis of OTC has been extensively studied (Petkovic et al. 2017). The genome of wild-type S. rimosus ATCC 10970 strain was sequenced in our previous study (Pethick et al. 2013). The pathway-specific regulators and the global regulators play important roles in the regulation of secondary metabolism of antibiotic production. These are capable of repressing or triggering the expression of genes involved in biosynthesis of antibiotic. To date, the Streptomyces antibiotic regulatory proteins (SARPs) are the best-characterized pathway-specific regulators, which possess an OmpR-like winged helix–turn–helix (HTH) DNA-binding motif near the N-terminus and an adjacent bacterial transcriptional activation domain (BTAD) (Wietzorrek and Bibb 1997). As recently demonstrated, an SARP positive regulatory protein OtcR was located in OTC biosynthesis gene cluster oxy in S. rimosus. Regulatory protein OtcR directly activates five promoters in oxy cluster (Yin et al. 2015). When considering global regulators, many of pleiotropic regulatory proteins belong to TCSs, which is the major signal transduction system used by bacteria to sense and respond the environmental stimuli (Hakenbeck and Stock 1996; Bijlsma and Groisman 2003). Naturally, typical TCS contains a histidine kinase (HK) bound on cell membrane that senses specific environmental stimuli and a corresponding response regulator (RR) that mediates the cellular response mainly through the transcriptional regulation of target genes (Mascher et al. 2006). Moreover, TCS has been considered to play an active role in different kinds of bacterial cellular responses, for instance, sporulation, chemotaxis, osmoregulation, antibiotic production, and so on (Ogura and Tanaka 2002; Bijlsma and Groisman 2003; Hutchings et al. 2004). In general, when environmental signals detected by TCS are achieved by autophosphorylation of the histidine kinase at a conserved histidine residue. The phosphorylation of an aspartic acid residue of the response regulator results from the phosphorylated histidine of these histidine kinases. A conformational change is induced by the phosphorylation of the response regulator proteins, which alters their binding properties. 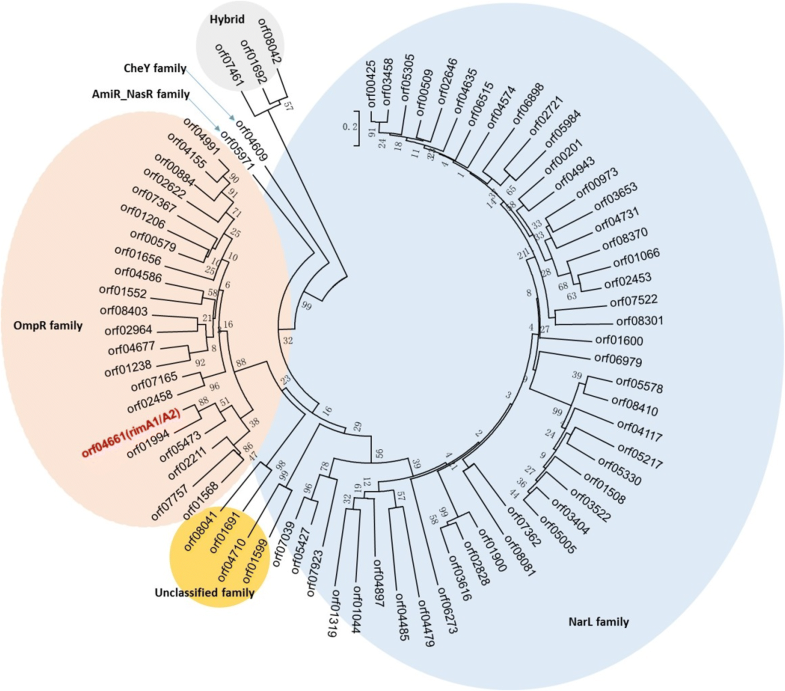 Streptomyces coelicolor is genetically the most studied Streptomycetes strain (Bentley et al. 2002) and bioinformatics analysis of the complete genome sequence of S. coelicolor revealed 84 putative histidine kinase genes and 80 putative response regulator genes, and 67 typical TCSs was found out from these HKs and RRs. Although only a limited number of the TCS gene homologues have been studied, it clearly implies that TCSs play important physiological roles in S. coelicolor. So far, only few TCSs have been identified to play their roles in the regulation of antibiotic biosynthesis in S. coelicolor, such as AbsA1A2 (Adamidis et al. 1990; Brian et al. 1996; Ryding et al. 2002; McKenzie and Nodwell 2007), AfsQ1Q2 (Shu et al. 2009; Wang et al. 2013), CseBC (Paget et al. 1999), DraRK (Yu et al. 2012a, b), PhoRP (Sola-Landa et al. 2005; Rodriguez-Garcia et al. 2007; Sola-Landa et al. 2008; Santos-Beneit et al. 2009), and RapA1A2 (Lu et al. 2007). For example, positive regulatory role of the RapA1A2 in actinorhodin biosynthesis was observed in S. coelicolor on rich R4C medium (Lu et al. 2007). In this study, a TCS RimA1A2 in S. rimosus with high similarity to TCS RapA1A2 in S. coelicolor was identified and characterized. After thorough evaluation of phenotype of the S. rimosus rimA1-disrupted mutant strain culture under diverse cultivation conditions, and under influence of different environmental stress conditions, we demonstrate that RimA1A2 plays a significant role in regulation of OTC biosynthesis only under specific environmental stress conditions, which are, however, not comparable to the optimal conditions used for industrial OTC production. Finally, we have also observed the role of RimA1A2 in OTC biosynthesis in relation with the osmotic and oxidative stress response, thus presenting the complex regulatory role of this TCS in S. rimosus. Bacterial strains and plasmids used in this work are shown in Table 1. S. rimosus M4018, a type strain, was used as the donor of DNA as well as the parental strain for strain construction. E. coli DH5α was used for regular cloning. S. rimosus M4018 and its derivatives were grown on wheat bran medium (2.5% agar, 7.5% wheat bran) at 30 °C for spore suspension preparation. Solid minimal medium in which l-asparagine (Asn) was replaced by 50 mM l-glycine (Gly), as the sole nitrogen source was used for OTC production determination, growth curves, and RNA preparation. The mycelium of S. rimosus was grown on Tryptone soya broth (TSB) medium at 30 °C. E. coli ET12567 was used for obtaining unmethylated DNA for transformation into S. rimosus. Conjugal transfer of S. rimosus on MS agar was performed as described in earlier study by Kieser et al. (2000). E. coli cultures were grown on LB medium at 37 °C, and chloramphenicol (25 μg/ml), apramycin (50 μg/ml), and kanamycin (50 μg/ml) were supplemented into the medium as required. Molecular manipulations of E. coli and S. rimosus were performed as the methods described in the previous works (Sambrook et al. 1989; Kieser et al. 2000). The plasmids used in this work are shown in Table 1. Total genomic DNA (gDNA) of S. rimosus was isolated from a 24–36 h culture in TSB according to the procedure described in the previous work (Hopwood et al. 1985). The disruption mutant was constructed by replacing the response regulator gene (rimA1). To construct rimA1 disruption plasmid pKC1139-rim, part of rimA1 gene about 524 bp was amplified with primers DrimF and DrimR (Table 2) from gDNA of S. rimosus M4018. All the primers used in this study are listed in Table 2. After that, the amplified fragment was inserted into the EcoRV site of the pMD19-TS vector, and the fragment was digested by HindIII and XbaI. The resulting DNA fragment was inserted into HindIII and XbaI digested pKC1139 (Bierman et al. 1992) to obtain pKC1139-rim. The recombinant plasmid pKC1139-rim was transformed into E. coli ET12567 and successively introduced into S. rimosus M4018 by intergeneric conjugation (Kieser et al. 2000). pKC1139 contains a temperature-sensitive replicon from S. ghanaensis that only works at temperatures below 34 °C. Apramycin-resistant exconjugants were selected at 37 °C, and the rimA1-disrupted mutant (S. rimosus M4018 Δrim) was confirmed by PCR with primers rim-single-P1/rim-single-P2, aprF/aprR (Table 2), and product sequencing. The integrative vector pIB-KA was generated by inserting kanamycin resistance fragment into the NheI site of the pIB139. This kanamycin resistance fragment contained the entire kanamycin resistance gene and about 100 bp of DNA on both side of the gene including the promotor and transcription terminator region. In addition, this fragment was amplified by PCR using plasmid pET-28a (Novagen, USA) as templates with primers pKANTTF/pKANTTR. For the construction of complementation plasmid, a 2070 bp DNA fragment containing the entire rimA1/A2 gene was amplified by PCR from the gDNA of M4018 using rim-pIBF and rim-pIBR primers. This fragment was digested by corresponding enzymes and inserted into EcoRI and NdeI digested pIB-KA downstream of the ermE* promoter to obtain pIB-KA-rim. The plasmid was transformed into S. rimosus M4018 Δrim by conjugation, as mentioned above, apramycin-resistant and kanamycin-resistant exconjugants were selected for this. The resulting complementation strain M4018 Δrim (pIB-KA-rim) containing an integrated copy of rimA1A2 was confirmed by PCR with primers rimL/rimR preliminarily. To generate M4018 Δrim (pIB-KA) used as control, a demethylated empty plasmid pIB-KA was introduced into M4018 Δrim. The demethylated plasmids pIB-KA-rim and pIB-KA were also transformed into S. rimosus M4018 by conjugation to obtain overexpression strain M4018 (pIB-KA-rim) and its corresponding control strain M4018 (pIB-KA). The integration of gene was occurred between the attP site located in pIB-KA and the ΦC31 attachment attB site in the S. rimosus chromosome. New attL fragment (401 bp) and attR fragments (502 bp) were developed after the integration. attL fragment was confirmed by PCR using primers attLF and attPR, and attR fragments were confirmed by PCR using primers attPF and attRR. All the plasmids mentioned were identified by enzyme digestion and DNA sequencing. The spores of S. rimosus were collected, respectively, when all the strains are cultivated on wheat bran medium at 30 °C for 5–7 days. The concentrations of spore suspension were determined by dilution method of plate counting. The spore suspension of different strains was inoculated into MM liquid medium supplemented with 50 mM glycine to a final concentration of 1.0 × 106 spores/ml. All fermentation cultures were cultivated at 30 °C on a rotary shaker (220 rpm) for 7 days. All mutants were undertaken in three parallels to ensure reproducibility. Culture samples were taken after every 24 h.
For dry cell weight determination, 2 ml culture samples at different times were washed twice with ultrapure water and dried at 90 °C until constant weight is achieved. For an assessment of OTC production, the pH of fermentation culture samples were adjusted to 1.5–2.0 with 9 M HCl and centrifuged at 12,000 rpm. After that, a 0.22 μm filter (Merck Millipore, USA) was used to filter the supernatant. Subsequently, 20 μl sample was analyzed using high-performance liquid chromatography (HPLC, Agilent 1100 HPLC system) equipped with a C18 column (4.6 × 200 nm, Kromasil, Sweden). A mix solution containing 10% phosphoric acid (0.2 M), 10% methanol, 20% acetonitrile, and 60% H2O was applied with a constant flow rate of 0.8 ml/min as per the method described by the previous work (Wang and Yang 1995). The corresponding detected peak areas at 350 nm were used to calculate the concentration of OTC. A standard OTC sample (Sigma, USA) was used to make standard curves. RT-PCR was used to determine whether rimA1 and rimA2 were co-transcribed, and qRT-PCR was used to determine the transcriptional level of the target genes. Briefly, S. rimosus mycelia were collected and frozen immediately in liquid nitrogen followed by grounding into powdered form. Fresh samples were stored at − 80 °C after liquid nitrogen freezing for total RNA extraction. The AxyPrep™ multisource total RNA miniprep kit (Axygen, USA) was used for total RNA extraction as per the manufacturer’s instructions. The concentration and purity of RNA were measured with Nanodrop 2000 (Thermo Scientific, USA) as per the manufacturer’s instructions. RNA samples (RNA: protein ratio, OD260/OD280, 1.8–2.0) were screened through gel electrophoresis to check their integrity (Bustin et al. 2009; Taylor et al. 2010). All experiments were performed in triplicates. For reverse transcription, PrimeScript™ RT Reagent Kit with gDNA Eraser (TaKaRa, Japan) was used as per the manufacturer’s instructions. Nanodrop 2000 was used to analyze the concentration of cDNA. cDNA samples in ten-fold serial dilution was prepared to make a standard curve and each dilution was performed under a range of temperatures around the calculated Tm of the primers to be used in the experiments (Table 2). All RNA samples without prior reverse transcription performed PCR amplification to exclude the possibility of DNA contamination. RT-PCR was used to determine whether rimA1 and rimA2 are co-transcribed by primers co-rimF/co-rimR (Table 2). Gene hrdB in S. rimosus was served as positive internal control for RT-PCR. RNA treated with DNase I was used as a negative control. The reverse transcription procedure was as follows: 94 °C for 3 min, 28 cycles for 94 °C 30 s, 62 °C 30 s, 72 °C 30 s. The reaction samples were analyzed by electrophoresis. SYBR® GC Premix Ex Taq™ kits (TaKaRa, Japan) was used to perform qRT-PCR according to the manufacturer’s instructions. The melting curve analysis was executed by a CFX96™ real-time PCR detection system (Bio-Rad, USA) (Lu et al. 2007; Rozas et al. 2012; Yu et al. 2012a, b). The optimized Tm and cDNA concentration of each gene were used for qRT-PCR analysis and the Cq values were determined for optimization of qRT-PCR conditions (Taylor et al. 2010). The relative transcript levels of tested genes were normalized to hrdB and were determined using the 2-DDCT method (Livak and Schmittgen 2001). Error bars indicated the standard deviation from three independent biological replicates. Data were analyzed by t test, *P < 0.05, significant difference. Three biological samples from the different bacterial cultures were triply amplified in separate PCR reactions. Susceptibility of the rimA1-disrupted mutant to antimicrobial agents was tested by a disk-diffusion assay on MM with 50 mM glycine. The same amount of spore of M4018 and other mutants was spread on the solid medium, and then, three Oxford cups (6 mm in diameter) were put on the medium uniformly in one plate. Different kinds of antibiotic with different concentration were added to the Oxford cup, but the volume of the solution added was kept same (200 μl). The radii of the inhibition zone were measured after 3 days of incubation. The radius of the inhibition zone from S. rimosus M4018 plate was used as a control. The antibiotics used for the study included oxytetracycline (20, 50 mg/ml), kanamycin (2.5, 10, 25 mg/ml), chloramphenicol (0.25. 0.5, 1 mg/ml), rifamycin (2.5, 10, 25 mg/ml), cefotaxime (2.5, 10, 25 mg/ml), ampicillin (2.5, 10, 25 mg/ml), and erythromycin (2.5, 10, 25 mg/ml). To evaluate the OTC production of all the S. rimosus mutants grown under various environmental stresses, the liquid MM with 50 mM glycine containing each of the following chemicals KCl (0.1 M) and H2O2 (2 mM) was prepared. The spore suspensions of different mutants were inoculated into these media to a final concentration of 1.0 × 106 spores/ml, respectively. All fermentation cultures were cultivated at 30 °C, 220 rpm for 7 days. Samples were taken from the 250 ml shake flasks once a day and the concentration of OTC was determined by HPLC. Total size of S. rimosus M4018 genome is estimated to be 9.2 Mb with a G+C content of 71.96%. The draft genome of S. rimosus M4018 is estimated to have a total of 8584 protein-coding genes, which is largely in agreement with genome of S. rimosus ATCC 10970, the wild-type strain, and in agreement with Pethick et al. (2013). Putative open reading frames (ORFs) and the corresponding proteins in the M4018 strain genome were annotated based on the PFAM database (Finn et al. 2016). 77 putative response regulators, containing the response-reg domain and 177 putative histidine kinase homologs including Hpt, HisKA, HisKA_3, HATPase_c_2, and HATPase_c domain, were identified in the genome of M4018 strain (data not shown). Phylogenetic analysis was established by applying software MEGA 7 with Neighbor-Joining method to analyze the 77 response regulators with response reg domain (Kumar et al. 2016). According to our analysis, the most RRs identified in the genome of M4018 strain belong to the OmpR and NarL families (Fabret et al. 1999; Hutchings et al. 2004) (Fig. 1). 50 pairs of typical TCS comprising a histidine kinase and a cognate response regulator protein were screened, considering that HK and RR of a typical TCS are adjacent to each other on the chromosome, and they are generally transcribed in the same orientation. Comparative analysis of 50 typical TCSs identified in the M4018 genome with all the TCSs of S. coelicolor published in the literature also identified the orf04661 (RR) and orf04662 (HK) TCS homologues, with 82% and 71% identity to RapA1 (RR) and RapA2 (HK) in S. coelicolor at amino acid sequence level, respectively (Lu et al. 2007). It was demonstrated that TCS homologue RapA1A2 in S. coelicolor is involved in the regulation of secondary metabolite biosynthesis (Lu et al. 2007). Based on this information, we aimed to evaluate the potential role of RapA1A2-like homologues orf04661 (RR) and orf04662 (HK), designated here as RimA1A2 in OTC biosynthesis and in potential physiological and morphological properties of the 4018 strain under different culture conditions. Genes rimA1 and rimA2 are adjacent to each other on the M4018 chromosome, and they are transcribed in the same orientation (Fig. 2). The rimA1 gene encodes a 220 aa protein with a deduced molecular mass of 23.8 kDa. It is identified as the response regulator of OmpR family at amino acid level (Hutchings et al. 2004). It contains several conserved amino acids on the N terminal region, which are required for the formation of phosphorylation pocket including Asp-8, Asp-51 (the putative phosphorylation site), and Lys-101 (Stock et al. 1989). It is suggested that the DNA-binding pocket containing DNA-binding motif, located on the C-terminus of the protein, mediates the direct involvement in the regulatory activity, by binding on the target DNA sequence (Bijlsma and Groisman 2003). The gene product encoded by rimA2 is a putative 467 aa protein with a deduced molecular mass of 49.7 kDa. Hypothetical transmembrane domain is identified in its amino-terminal region, which may serve as an anchor to the cytoplasmic membrane. The deduced RimA2 protein displays typical properties of the sensory protein of prokaryotic histidine kinases, containing the H box (His-271 being the putative phosphorylation site) and motifs N, G (Hoch and Silhavy 1995; Kim and Forst 2001; Bijlsma and Groisman 2003). The stop and start codons of rimA1 and rimA2, respectively, overlap by 8 bp (Fig. 2), strongly suggesting that both genes are co-transcribed. We have performed RT-PCR assay with a pair of primers (co-rimF and co-rimR, Table 2) to determine whether the two genes are form an operon or not. Primer co-rimF is located at the last 155–180 bp from the 3′-end of rimA2 and primer co-rimR is located at the first 265–290 bp of the 5′-end of the downstream gene rimA1 (Fig. 2). Expected size (458 bp) of the PCR product, corresponding to the expected DNA fragment containing part of rimA1/A2, was detected (Additional file 1: Figure S1), suggesting that the two genes were co-transcribed as a single-polycistronic mRNA. The TCS RapA1/A2, which regulates the biosynthesis of both actinorhodin and a type I polyketide in S. coelicolor, was first identified by Lu et al. using genetic and proteomic approaches (Lu et al. 2007). Although no growth and morphological difference was shown between the rapA1/A2 knockout mutant and wild-type strain S. coelicolor M145, a distinct decrease in the production of ACT was observed in rapA1/A2 mutant when cultivated in rich R4C agar or R4C liquid media. In this study, we constructed a rimA1-disrupted mutant of S. rimosus 4018 (M4018 Δrim). Compared with the parental strain S. rimosus M4018, the disruption mutant M4018 Δrim showed no visible change in the culture pigmentation, OTC biosynthesis, morphology, or any other phenotype when cultivated on rich media such as TSB (Fig. 3), R4C, MS, and R2YE (Hopwood et al. 1985) (data not shown). OTC biosynthesis, which is catalyzed by the type II polyketide synthase (PKS), has been extensively studied (Petkovic et al. 2017). OTC production is well correlated with pigment formation in the culture of S. rimosus strains, considering that OTC itself is pigmented compound (Petkovic et al. 2006). Therefore, relative yield of OTC on a solid agar plate or in a liquid medium correlates roughly to the intensity of the orang–brown pigment. Pigmentation and OTC production, however, also depends upon the composition of medium. Often, the phenotypic difference between the parental strain and its mutant could only be observed at specific cultivation conditions, such as cultivation on minimal medium (MM) or medium with different sources of carbon, nitrogen, or phosphate (Sola-Landa et al. 2003; Shu et al. 2009; Yu et al. 2012a, b). Therefore, we set up testing procedure, where we carried out comparative evaluation of the morphological properties of rimA1-disrupted mutant and parent strain M4018 in an MM medium supplemented with various medium components on the agar medium plate assay. Initially, the glucose was replaced by different carbon sources such as d-mannitol, lactose, arabinose, starch (gelatinized before use), and maltose. Independently on the carbon source, the molar concentration of carbon was maintained at 330 mM, considering that MM containing 10% glucose (55 mM) was used as control. After 4 day cultivation, no significant morphological difference between S. rimosus M4018 and the rimA1-disrupted mutant was observed on any medium tested (Additional file 1: Figure S2). In the second step, we carried out testing procedure in a plate assay on an MM medium supplemented with different organic nitrogen sources (Shu et al. 2009; Yu et al. 2012a, b). Nine nitrogen sources, including amino acids glycine (Gly), threonine (Thr), proline (Pro), asparagine (Asn), aspartate (Asp), glutamate (Glu), glutamine (Gln), lysine (Lys), and alanine (Ala), were tested, and their concentrations in the MM medium were adjusted to 50 mM. Interestingly, we observed significant increase in pigmentation intensity with rimA1-disrupted strain when cultivated on MM with 50 mM Gly as the sole nitrogen source, and no difference was observed when cultivated on MM supplemented with 50 mM Asn (Additional file 1: Figure S3), thus indicating that RimA1A2 may negatively regulate OTC biosynthesis. Actually, these nine nitrogen sources were divided into three groups. In the first group, including Lys, Ala, Asn, and Glu, no visible difference was observed when the nitrogen source is added into MM. In the second group, including Thr, Pro, and Gln, the visible difference was observed when the nitrogen source is added into MM, but the relative OTC production was low. In the third group, including Asp, Gly, the visible difference was observed when the nitrogen source is added into MM, and the relative OTC production was high. The most significant difference in pigment production was observed when MM was supplemented with Gly among all the nitrogen sources. In the next step, we aimed to evaluate potential role of RimA1A2 in the regulation of OTC production in the liquid culture. S. rimosus M4018 and the rimA1-disrupted mutant (M4018 Δrim) were cultivated in the liquid MM supplemented with 50 mM glycine. MM supplemented with 50 mM Asn was used as control. 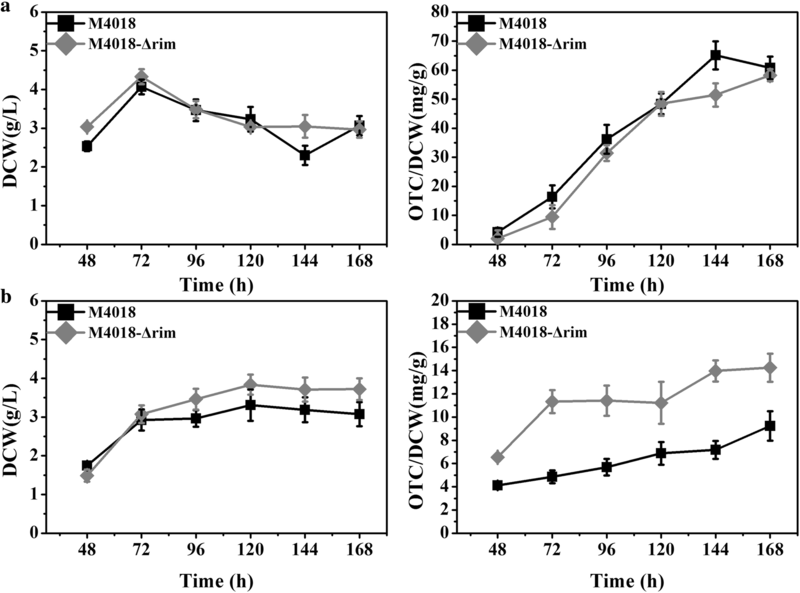 M4018 Δrim and M4018 showed the identical growth rate and OTC titer when cultivated in liquid MM supplemented with 50 mM Asn (Fig. 4a). The rimA1-disrupted strain showed a slightly increased growth rate when cultivated in liquid MM supplemented with 50 mM Gly. However, disruption of rimA1 resulted in significant increase of OTC production in liquid MM supplemented with 50 mM Gly. OTC titer of the rimA1-disrupted strain was increased by 63%, compared to that of M4018 after 5 days of cultivation (Fig. 4b). To make sure that the phenotypic changes observed in the rimA1-disrupted strain were not caused by a polar effect, so we carried out in-trans complementation of the entire rimA1A2 expressed under strong ermE* promoter in the rimA1-disrupted strain using the ΦC31-based integrative vector pIB-KA. The complementation of the rimA1-disrupted strain with the entire rimA1A2 expressed under strong ermE* promoter reduced OTC production of the disruption mutant cultivated on MM supplemented with 50 mM glycine. Nevertheless, the complementation mutant M4018 Δrim (pIB-KA-rim) still produced more OTC compared to the parent M4018 strain containing an extra copy of rimA1A2 expressed under strong ermE* promoter [M4018 (pIB-KA-rim)] at the end of the culture (t > 144 h) (Fig. 5), which is an additional confirmation that RimA1A2 act as a negative regulator when cultivated on MM supplemented with Gly. We have not observed any significant difference in OTC production when comparing M4018 (pIB-KA) and M4018, or comparing M4018 Δrim and M4018 Δrim (pIB-KA) strains, indicating that the introduction of the empty pIB-KA plasmid had no effect on the OTC production in M4018 parent and M4018 Δrim strains. We can, therefore, conclude that the increase in OTC production was really due to the disruption of the rimA1 gene which further confirms that the RimA1A2 negatively regulates OTC biosynthesis. As mentioned earlier, two-component regulatory elements are very abundant in secondary metabolite-producing organisms such as S. rimosus. However, limited data are available in the literature on the wider environmental aspect of TCSs, and their role in diverse physiological processes and morphological differentiation in filamentous organisms such as Streptomyces species. Among the presumptive signals, the potentially sensed by TCS are the chemical and physical parameters such as presence or lack of different ions, temperature and pH value variation, the redox state of electron carriers in the environment, oxygen pressure, osmolality, and many other culture parameters (Bang et al. 2000; Ahn et al. 2012; Djoric and Kristich 2015). Therefore, we also attempted to determine the role of response regulator RimA1 to the exposure of S. rimosus against different antibiotics in the environment. Conclusively, we evaluated the potential role of RimA1 in the regulation of OTC production under different environmental stresses conditions including increased osmolality and oxidative stress. The applied approach in this study provides us more comprehensive understanding of the role of TCS such as RimA1A2 on environmental adaptation and antibiotic production. 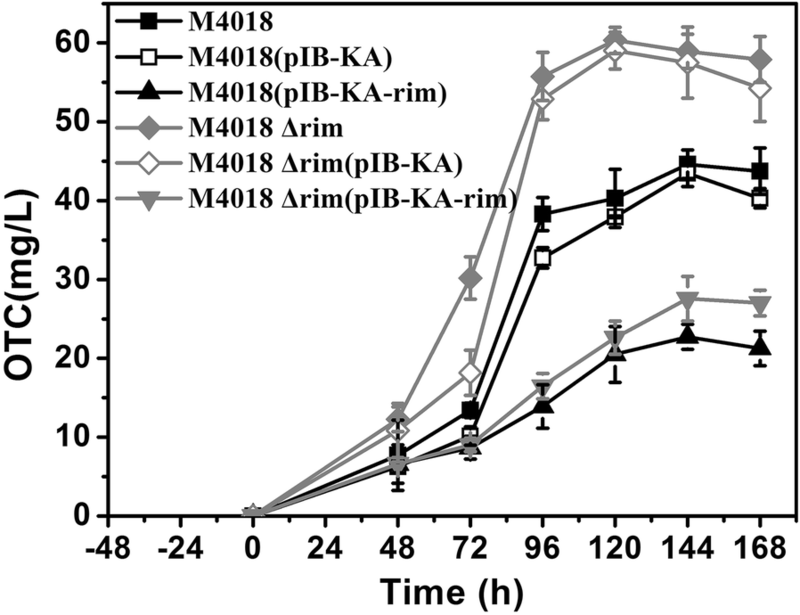 The disk-diffusion assay was applied to determine the degree of sensitivity of the rimA1-disrupted mutant to the selected antibiotics compared to the M4018 parent strain. The spores of M4018 and M4018 Δrim were spread on the solid medium plate and the antibiotic solutions were added into the Oxford cup. The diameter of inhibition zone was inversely proportional to the resistance, as described in “Materials and methods”. We have observed that the self-resistance of M4018 Δrim against OTC was slightly enhanced (about 10–15%) (Table 3). This phenomenon corresponded to the increase of OTC production of the rimA1-disrupted mutant. In comparison with the parental strain, M4018 Δrim also showed increased resistance to kanamycin (about 30%) and chloramphenicol (about 25%) (Table 3). The resistance of the M4018 Δrim strain to the remaining panel of antibiotics was not significantly different compared to M4018 strain. The response regulator mutants were tested for its ability to produce OTC under different environmental stresses conditions including increased osmolality (addition of KCl) and oxidative stress (addition of H2O2). The disruption mutant M4018 Δrim showed increased OTC production level in liquid MM supplemented with 50 mM glycine. Under identical cultivation conditions, the overexpression of rimA1A2 in the strain containing the second copy of rimA1A2 expressed under strong constitutive ermE* promoter resulted in significant decrease in OTC production (Fig. 6a). In general, KCl has been extensively used as an osmotic stress-inducing agent in E. coli, Streptomyces and other bacteria (Sugiura et al. 1994; Wood 1999; Bishop et al. 2003). Under osmotic stress caused by the addition of KCl, however, the production of OTC with all tested strains was reduced. The reduction in OTC yield varied depending upon the strain tested (Fig. 6b). The yield of OTC was evaluated at the 6th day of cultivation, considering that OTC yield generally reached the highest value after 6 days of cultivation (Fig. 6). As described in “Materials and methods”, after the addition of KCl into MM + Gly at concentration of 0.1 mM, we observed the reduction of the final yield of OTC by 78% with M4018 Δrim (pIB-KA) strain. On the other hand, when the control strain M4018 (pIB-KA) containing empty vector was tested, we observed 39% reduction in the OTC yield. Finally, only 21% reduction in the final OTC yield was observed in the culture of the parent strain containing the second copy of rimA1A2 expressed under strong promoter ermE* (Fig. 6b, Table 4). Although overexpression of RimA1A2 negatively regulated OTC production in liquid medium MM + gly with 4018 parent strain, the overexpression of rimA1A2 resulted in increase in yield of OTC when cultivated under adverse osmotic pressure condition. We, therefore, conclude that in relation with OTC biosynthesis, the overexpression of RimA1A2 plays positive role in osmotic stress adaptation. Besides, the rimA1-disrupted mutant was also tested for its ability to produce OTC under oxidative stress, which is induced by H2O2 (Beites et al. 2011; Ahn et al. 2012). H2O2 was added to the liquid MM + gly before inoculation at the final concentration of 2 mM. When M4018 (pIB-KA), M4018 (pIB-KA-rim), M4018 Δrim (pIB-KA), and M4018 Δrim (pIB-KA-rim) were cultivated in MM + gly supplemented with H2O2, the oxidative stress resulted in the partial loss of OTC production to all the strains. However, it caused reduction in the final yield of OTC, depending on the strain tested (Fig. 6c, Table 4). 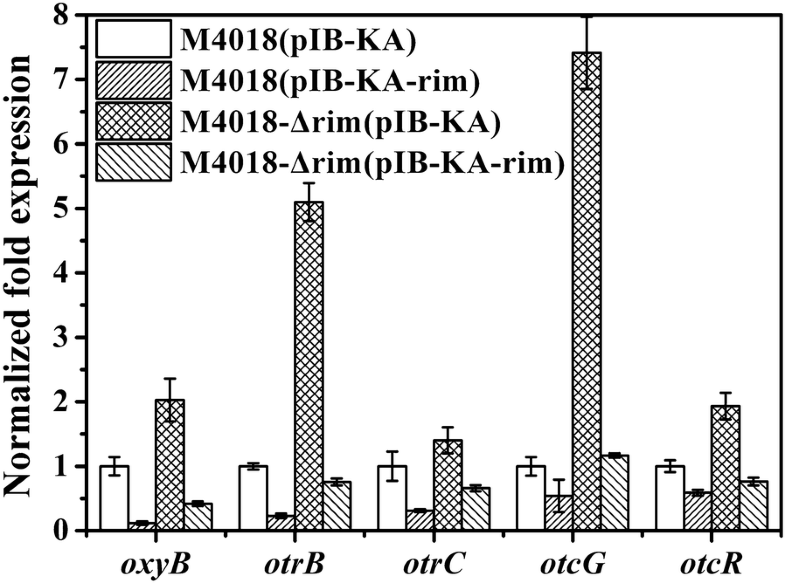 The final yield of OTC of the M4018 Δrim (pIB-KA) was reduced by 33% under oxidative stress, compared to the control strain M4018 (pIB-KA) and rimA1-overexpressed strain M4018 (pIB-KA-rim), reaching reduction of OTC titer of 54% and 76%, respectively (Table 4). Based on these results, we can conclude that the rimA1-disrupted mutant M4018 Δrim (pIB-KA) exhibited the highest oxidative stress tolerance in relation with the OTC production, in contrast to the osmotic stress caused by KCl addition, where the rimA1-disrupted strain showed the highest osmotic stress related to the OTC production. We have thus demonstrated that the RimA1A2 has a role in the regulation of OTC production in response to different environmental stresses. Compared with M4018 parent strain, OTC titer of the rimA1-disrupted mutant was significantly enhanced in MM supplemented with 50 mM glycine. The main cause for increase in OTC production by M4018 Δrim (pIB-KA) strain could be consequence of changes in metabolic supply of building blocks, used in OTC biosynthesis, malonyl-CoA in this case, and/or in overexpression of genes involved in OTC biosynthesis. OTC is a polyketide secondary metabolite, like many of secondary metabolites produced by Streptomyces; the genes carrying out regulation of OTC biosynthesis are most often grouped to form a uniform gene cluster (Pickens and Tang 2010). Genes oxyB, otrB, otcG, and otcR from the OTC gene cluster and OTC resistance gene otrC located outside the cluster (Yu et al. 2012a, b) were selected for further investigation of transcriptional profile of target genes by qRT-PCR and to determine the effect of RimA1A2 on the expression profile of genes located in the oxy gene cluster. While oxyB is a member of so-called minimal PKS, catalyzing formation of nascent polyketide chain (Pickens and Tang 2010), otrB encodes a membrane protein engaged in transport the intracellular OTC out of the cell thus ensuring sufficient self-resistance (Ohnuki et al. 1985; McMurry and Levy 1998). otcG plays a role of conditionally positive regulatory gene in OTC biosynthesis (Lesnik et al. 2009). On the other hand, otcR encodes a pathway-specific regulator that directly activates five promoters from oxy cluster (Yin et al. 2015). The only gene located outside otc gene cluster is the resistance gene otrC, identified by Yu et al. as an ABC transporter with multidrug resistance function (Yu et al. 2012a, b). As observed in the literature, all the selected five genes have a positive role in OTC production when over-expressed. The control strain M4018 (pIB-KA), the rimA1-disrupted mutant M4018-Δrim (pIB-KA), the overexpression mutant M4018 (pIB-KA-rim), and the complemented mutant M4018 Δrim (pIB-KA-rim) were used to carry out comparative transcriptional analysis of these five selected genes. As shown in Fig. 7, when rimA1 gene was disrupted, the transcriptional level of all five genes increased significantly. However, observed increase of gene expression varied, when evaluated after 96 h of cultivation in MM supplemented with Gly. On the other hand, we have observed reduction of the transcriptional level of all five genes when the rimA1A2 was overexpressed in trans under strong constitutive ermE* promoter. In the control experiment, the entire operon RimA1A2 was used to complement the disrupted mutant strain M4018 Δrim, and the transcriptional levels of the genes under investigation in these strains were similar to the M4018 parent strain with chromosomally integrated empty plasmid pIB-KA (Fig. 7). Therefore, we have demonstrated that disruption of rimA1 led to overexpression of biosynthetic genes of the oxy gene cluster. The genome sequence of Streptomyces has revealed a large proportion of regulatory genes, for example, approximately 12% of the total ORFs in S. coelicolor (Bentley et al. 2002). The first complete genome of model organism S. coelicolor allowed us to analyze typical TCSs, unpaired HKs and orphan RRs (Bentley et al. 2002) and 67 typical TCSs have been found in this organism. Nearly, all the studied TCSs, which have been characterized in Streptomyces, derived from S. coelicolor (Rodriguez et al. 2013). Although these regulatory elements are widespread throughout the bacteria, little is known about the signals sensed by HK or the downstream binding site of RR in each system, and relatively little is known about their function in secondary metabolism. However, so many TCSs in the S. coelicolor genome clearly imply their important physiological roles. To best of our knowledge, not a single TCS has been characterized in S. rimosus. Most likely, this might happens due to lack of genomics data, and no connection between OTC biosynthesis and potential function of TCSs has been observed to date. Analysis of the S. rimosus M4018 genome revealed about 50 pairs of typical TCSs (Fig. 1). We have identified TCS homologue, designated as RimA1A2, which shows high identity to RapA1A2 from S. coelicolor. In S. coelicolor, RapA1A2 regulates the biosynthesis of ACT and an uncharacterized type I polyketide, and the regulatory function exerted by RapA1A2 was dependent on known pathway-specific regulatory genes for these two biosynthetic gene clusters (Lu et al. 2007). Considering that RapA1A2 from S. coelicolor exerts positive regulatory role in actinorhodin biosynthesis, we have selected one of the closest homologues designated as RimA1A2, and in continuation, we carried out comprehensive effort to evaluate potential role of this TCS in OTC biosynthesis. The analysis of amino acid sequence confirmed that RimA1 from S. rimosus M4018 is an OmpR family response regulator and RimA2 was a typical histidine kinase. Considering that OTC is medically important antibiotic, and it is produced at large scale by the industrial fermentation processes, most of the studies in the past have been focused predominantly on cultivation conditions which are comparable or even identical to the cultivation conditions used in industrial environment (Singh et al. 2012; Elsayed et al. 2015). In our study, however, we took different approach. We not only focus on OTC biosynthesis, but also describe the potential role of RimA1A2 on different physiological and morphological properties of S. rimosus. Similarly, as reported in S. coelicolor, when TCS AfsQ1Q2 (Shu et al. 2009) and DraRK (Yu et al. 2012a, b) were studied, we could not observe any obvious difference in OTC production, or any other phenotypic property of S. rimosus culture when evaluating rimA1-disrupted mutant in media regularly used for cultivation of S. rimosus, such as rich media TSB (Fig. 3), R4C or MS (Hopwood et al. 1985). Yu et al. demonstrated changes in culture pigmentation when S. coelicolor disrupted mutant ΔdraRK was cultivated on MM containing increased concentration of nitrogen sources such as Glu, Gln, Thr, and Gly or mineral sources of nitrogen such as KNO3 and (NH4)2SO4. Importantly, some studies have also observed the significant reduction in actinohrodin production. In contrast, biosynthesis of undecylprodigiosin (RED) was drastically increased (Yu et al. 2012a, b). We, therefore, assumed that RimA1A2 regulation of OTC biosynthesis in S. rimosus may be observed in a medium-dependent manner. Therefore, we make our efforts on testing different kinds of media. Hence, we tested different carbon and nitrogen sources in MM, the most obvious phenotypic changes to rimA1-disrupted mutant were observed in MM supplemented with Gly when many nitrogen sources such as Gly and Asp (data not shown) are added to MM separately. The disruption mutant M4018-Δrim displayed significant increase in OTC production when cultivated on MM supplemented with 50 mM glycine (Additional file 1: Figure S3). Thus, our experiments clearly demonstrated that Rim A1A2 negatively regulate OTC production in a medium-dependent manner. In contrast, in S. coelicolor, RimA1A2 homologue RapA1A2 regulates actinohrodin production positively when cultivated in R4C medium (Lu et al. 2007). Although OTC and ACT biosynthetically belong to the same group of metabolites, which belong to poliketides made of malonyl-CoA building blocks. Therefore, it is not surprising that these two metabolites are regulated in opposite direction by selected TCSs in these two streptomycetes. This most likely also depends on the composition of the medium used, considering that R4C medium consists of yeast extract and malt extract. An SARP activator, OtcR, was identified later in oxy cluster of S. rimosus by Yin et al., which directly activate five promoters from oxy cluster. According to the qRT-PCR analysis, the disruption of rimA1 could cause up regulation of the transcriptional level of otcR (Fig. 7). It is possible that RimA1A2 negatively regulates OTC production through the downregulation of otcR, thus acting as a global regulator. However, the RR RimA1-binding motif is not yet identified. Thus, at present, it is not possible to determine whether RimA1 directly interacts with the promoter regions of otcR by bioinformatics methods at this moment. This could be evaluated in the future work, whether RimA1 directly interacts with the promoter regions of five genes tested or other genes in the OTC cluster, which could potentially be detected by electrophoretic mobility shift assay (EMSA). Pleiotropic effect of RimA1A2 in pigment formation and OTC production is not the only phenotypic change that we have observed in S. rimosus. We have observed other physiological and morphological properties of RimA1A2-inactivated mutant strain of S. rimosus. To evaluate the potential impact of rimA1 disruption on OTC production when S. rimosus M4018 ∆rim was cultivated under different environmental stresses, osmotic and oxidative stress were introduced into MM containing 50 mM glycine. TCSs are the predominant form of signal transduction used by bacteria to respond against environmental stresses (Stock et al. 2000). Therefore, we set up experiments, where the S. rimosus growth rate and consequent secondary metabolite (OTC) production is evaluated when culture is exposed to KCl (osmotic pressure) or H2O2 (oxidative stress), respectively (Fig. 6). We have observed significant decrease in OTC production in the culture of mutant strain M4018 Δrim (pIB-KA) (78%), compared to M4018 (pIB-KA-rim) (21%), when exposed to KCl. Although we cannot bring any defined conclusions, the fact that WT strain with second copy of rimA1A2 expressed under strong constitutive promoter displays even lower response (only 21% reduction in OTC biosynthesis), it is reasonable to propose direct involvement of RimA1A2 into osmotic stress response. Oxidative stress is common response to all aerobic organisms, but it is particularly pronounced in industrial biosynthetic processes for secondary metabolite production, where high intensity of oxygenation (aeration) is applied (Beites et al. 2011). A number of studies demonstrated that adaptive response of oxidative stress does not only have “defense role”, but also has impact on the regulation of secondary metabolism. According to the literature, a number of transcriptional factors regulate expression of genes involved in oxidative stress response, which are regulated by different signaling pathways in the bacterial cell (Rao and Sureshkumar 2001; Wei et al. 2011; Hong et al. 2013; Montibus et al. 2015). The results on the oxidative stress response observed by treatment of the S. rimosus cultures by H2O2 were contrary to that of osmotic stress with KCl addition. The overexpression of rimA1A2 caused higher sensitivity of the culture to H2O2. Thus, it can be concluded that the function of RimA1A2 is rather to inhibit the process of oxidative stress response in the MM supplemented with glycine. However, considering that industrial strains with higher production of the target secondary metabolite can have oxidative stress response attenuated as demonstrated by Karnicar et al. (2016). The addition of H2O2 to the culture broth is an approach most often applied when evaluating the degree of oxidative stress. Thus, it can be hypothesized that RimA1A2 may play important role in the oxidative stress response. For the future experiments, where transcription profiles of different genes involved in the oxidative stress response in M4018 Δrim strain or rimA1A2-overexpressed strains is compared, could give us more information on this hypothesis. A TCS RimA1/A2 in S. rimosus was characterized in this work, displaying negative regulatory role in the biosynthesis of OTC in MM supplemented media with glycine as the sole nitrogen source. We have demonstrated that the transcription of a number of important genes in OTC biosynthesis was increased in the rimA1-disrupted mutant, thus demonstrating link between RimA1A2 and regulation of the genes from OTC cluster. We have also demonstrated the involvement of RimA1A2 in the regulation of OTC production under various environmental stresses conditions including increased osmolality and oxidative stress. These findings suggested that TCS RimA1A2 is among one of the global regulators to response different environmental stresses and regulate OTC production in a medium-dependent manner in S. rimosus M4018. We have also highlighted the importance of cultivation conditions when studying the function of regulatory elements. Numerous genome-sequencing projects have recently revealed a huge number of “silent” gene clusters, which most often also contain different type of regulatory elements, present in almost every antibiotic-producing bacterium. These clusters are encoding potentially useful metabolites, which have not been identified, considering that they are not produced under standard laboratory conditions. Therefore, this work emphasizes the importance of cultivation conditions when studying the function of regulatory elements and production of secondary metabolites, which is often neglected. This study also emphasizes the importance of medium composition and cultivation conditions applied in the scope of initial secondary metabolite screening and industrial strain improvement regimes. Moreover, the response of the industrial strains to mutagenesis and selection procedures greatly depends on the selection of the medium composition and cultivation conditions, this way directing isolation of strains with desired properties, often neglected at the industrial settings. It is, therefore, not that surprising that antibiotic-producing strains generally have such a large number of TCSs and complex regulatory network in general, this way ensuring high adaptation capacities of this microorganism to the changes in the environment. HN and MG conceived and designed the study. HN performed experiments, contributed collection and assembly of data, data analysis and interpretation, and manuscript writing. ZX performed the computational analysis. ZX, AM, MG, HK, JC, and YZ revised the manuscript. All authors read and approved the final manuscript. This research was supported by the Fundamental Research Funds for the Central Universities (No. 22221818014) to MG. This work as also supported by Slovenian Research Agency ARRS (Nos. J4-7637 and J4-8226) to HP. 40643_2019_238_MOESM1_ESM.docx Additional file 1: Figure S1. Co-transcription analysis of the TCS genes rimA1/A2 of S. rimosus M4018. Figure S2. 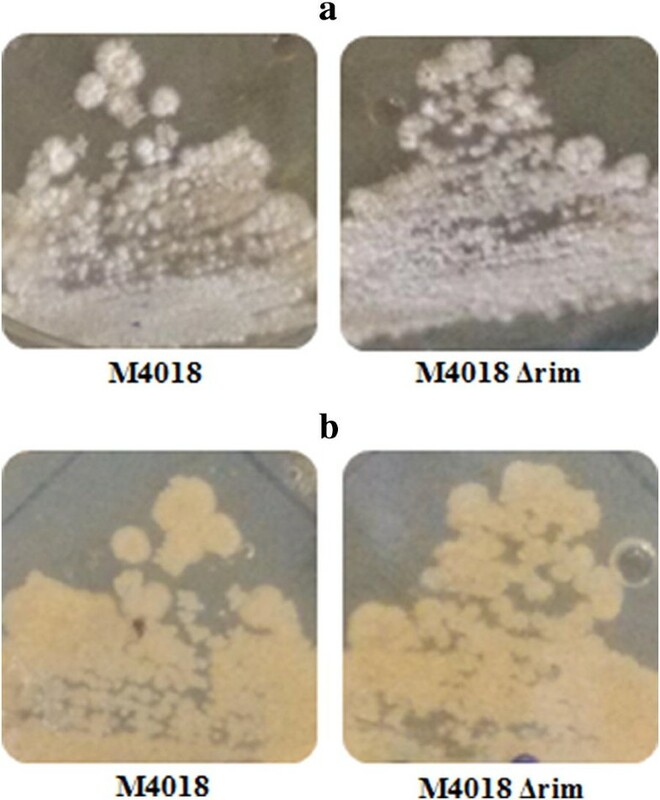 Morphological properties and pigmentation intensity of the parental strain M4018 and M4018 Δrim on MM medium supplemented with different carbon sources (A: glucose, B: D-mannitol, C: lactose, D: arabinose, E: starch, F: maltose). Figure S3. 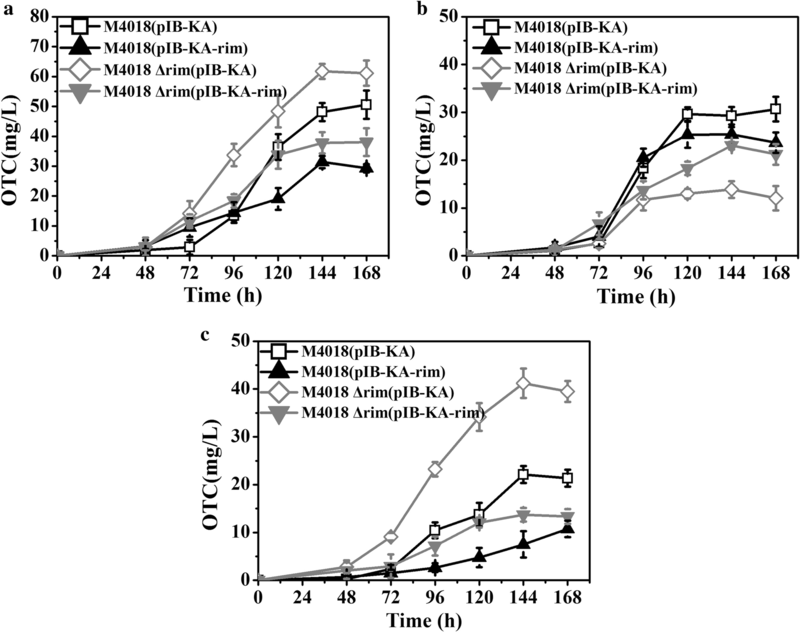 Morphological properties and pigmentation intensity of M4018 and rimA1-disrupted strain tested on the MM supplemented with 50 mM asparagine (A) or glycine (B).